It was a launch to remember: on Tuesday, SpaceX's Falcon Heavy soared into the sky from Cape Canaveral, Fla., complete with a dummy named 'Starman' destined to orbit between Earth and Mars. But it turns out, he's going a little farther than expected. "That was epic," SpaceX founder and chief executive Elon Musk said after the launch. "The most exciting thing I've ever seen, literally." While it was a perfect launch, not everything went off as planned. The two side boosters returned to the Kennedy Space Center landing pads in a ballet-like move, which Musk said looked "so ridiculous and impossible." The two boosters that landed aren't going to be used, he said, and there were no plans to reuse the one that was lost. Originally, the plan was to place Starman in an orbit that would take it between Earth and Mars. However, the second stage fired longer than originally planned, which has placed the car and driver into an orbit that reaches the asteroid belt between Mars and Jupiter. Musk spoke to the public about Starman after the launch. Starman has some goodies with him, including a copy of science fiction author Isaac Asimov's Foundation, a Hot Wheels Tesla Roadster — with a tiny Starman of its own — and a plaque with the names of SpaceX employees. There's also message on the dashboard with the words, "Don't Panic," a nod to sci-fi writer Douglas Adams's book The Hitchhiker's Guide to the Galaxy. And on a circuit board appear the words, "Made on Earth by humans." Starman is listening to David Bowie's Space Oddity as he cruises the solar system. Musk, who is also founder and CEO of Tesla, recognizes that the whole idea of launching a mannequin in a car blasting music is silly, "but silly and fun things are important." And for a while you could watch its journey live. He likes the idea that aliens may someday discover the car. Though two people have paid SpaceX for a ride around the moon at some future date, they won't be riding the Heavy, Musk said. Instead, they will likely launch on the BFR, Musk's next generation rocket that he hopes will make humans interplanetary. Musk said the development has been quite rapid. 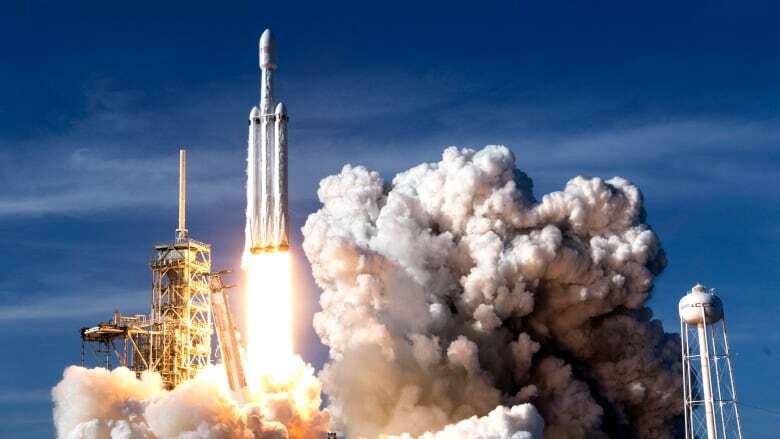 Though it wasn't a complete success, Musk is thrilled with what was accomplished and has hope that SpaceX can continue launching rockets and making it more accessible. "I really think we can do this a lot," he said.